Nostalgia for simpler times is at the core of my stories about Growin’ Up in Maine. Television in its infancy meant your choice of just 3 channels with ABC, CBS, and NBC, plus all 3 were broadcast in black and white only. Today’s youth might exclaim “No way!”, yet the first color television program I remember was Bonanza which premiered on September 12, 1959. If you’re old enough to recall television ads from the 1950’s, children were the preferred target market. Why, you ask? A child does not understand “no” for an answer when set on a particular toy or brand of cereal. To convince parents they could deflect objections better than any attorney or used car salesperson. Today’s children are still the best at selling fundraiser candy bars. Who can resist girl scout cookies? Now that the younger readers have learned television was originally black and white only up until the late 1950’s, and only had 3 channels, here’s a final surprising fact. 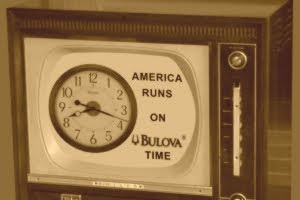 That very first $4 ten second tv advertisement was broadcast in 1941.